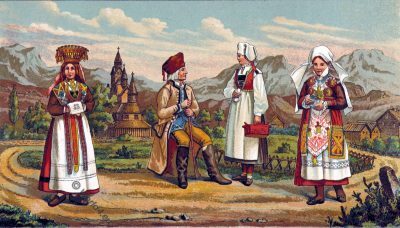 Historic costumes from Hardanger, Norway 1888. Home » Historic costumes from Hardanger, Norway 1888. 1. Bride from Hardanger (Norway). 2. Farmer from Hardanger in a Sunday dress. 3. Farmer’s wife from Hardanger in wedding dress (wedding mother) 4. Rich farmer’s wife from Skåne (Southern Sweden). Source: From the Baltic Sea to the north. A hike through Denmark, Norway and Sweden by Ferdinand Krauss. Publisher by Rainer Hosch, 1888. This entry was posted in 1888, 19th Century, Lapland, Norway, Scandinavia and tagged Norway folk costume, Traditional Lapland Folk Costume, Wedding dresses on 9/28/17 by world4.